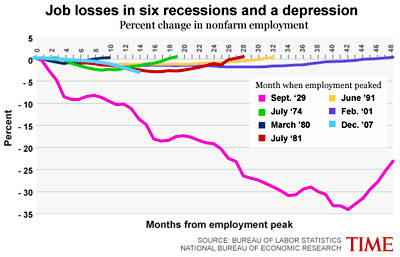 Justin Fox posted this chart yesterday showing job losses (so far) during the current recession compared to job losses during the Great Depression. It’s a pretty good panic corrective, showing just how far away we are from the problems of the 30s. It’s also, I think, a tribute to how much more we know about the economy these days than we did back then. Sure, it often seems as if we’re still so far in the dark we can barely see our own hands in front of our faces, but the fact is that we’re doing pretty well despite the fact that our underlying problems are probably every bit as severe as the imbalances that caused the Great Depression. Consider, after all, that our response to the Depression appears to have been 180 degrees wrong. We literally did almost everything possible to make it worse: we tightened the money supply, balanced the budget, raised interest rates, passed protectionist legislation, and allowed banks to fail by the hundreds. It escalated a panic into a Depression. And this time around? Just the opposite: interest rates are close to zero, we’re running an enormous budget deficit, protectionism has largely been kept at bay, money is being pumped into the economy prodigiously, and with the notable exception of Lehman Brothers banks are being saved right and left. These actions have reduced a panic to a severe recession. If we had taken the same policy actions that Hoover and Mellon took in the 30s, does anyone doubt that the results would have been another Great Depression? I don’t. We may still be doing a lot of dumb things, but we’re an awful lot smarter than we were 80 years ago.